Conventional home loans are become more difficult to obtain for families across America. From stringent home loan guidelines to large down payments, owning a home is becoming more challenging than ever. Military families, however, may have an alternative to conventional home loans, as they may be eligible to receive a VA loan. VA loans are a top choice for military families desiring a home, as they offer many advantages over conventional home loans. VA home loans offer less-stringent guidelines for applicants – Qualifying for a VA loan is often much easier than a traditional home loan. This is because VA loans are backed by the government, thereby allowing lending rules to be relaxed. That isn’t to say that every applicant will be approved for a VA home loan; only that it not be necessary to jump through as many hoops as would be necessary for obtaining a conventional home loan. VA homes loan allow home buyers to purchase a home with zero down – Up until just a few years ago, many home buyers were able to secure home loans with little or no money down. However, due to the recession and the housing crisis experienced over the last, few years, lenders now require much more in the form of a down payment from home buyers. VA home loans, however, are the exception to this rule, as they allow military personnel to obtain home loans with zero down. This means that many military personnel, whether active duty or retired, can enjoy the many benefits of home ownership without the need to bring a down payment to the table. VA home loans do not require private mortgage insurance – Most lenders of conventional mortgages require home buyers who do not put down at least 20 percent as a down payment to carry private mortgage insurance, often referred to as PMI. Private mortgage insurance is like a safety net for the lender if you default on your home loan. However, VA home loans do not require that home buyers carry PMI because VA loans are backed by the government. The elimination of PMI may be able to save you money each month on your home loan payment. VA home loans offer competitive interest rates – Because VA home loans usually come with highly competitive interest rates and no private mortgage insurance, it is possible to save a considerable amount of money each month on your mortgage payment. Many times, VA loans offer rates that are about 0.5 and 1.0 percent lower than conventional loans. Over the course of a home loan, this may equate to a significant difference in your monthly mortgage obligation. It is quite easy to find competitive VA home loan rates because lenders are more than willing to take on VA home loans because they are backed by the government. VA home loans are ideal for condo buyers – Many military personnel are interested in purchasing a condo instead of a single-family home, so they are often quite surprised to find that VA home loans cover condominiums, as well. The Department of Veterans Affairs does have certain criteria for condominium VA home loan approval, but it is often still quite realistic to obtain a VA home loan for a condominium. If you want to secure a home and you are in the military, it may pay to consider VA home loans and all of the advantages they offer to military families. Let the experts at VIP Realty help you locate the property that best meets your family’s needs and wants. 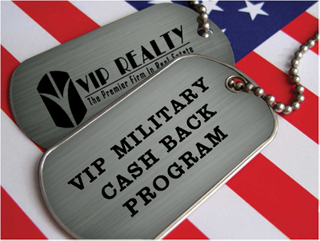 Claim Your Military Rebate Below!